My favorite holiday has come and gone, but I had a lovely time celebrating Thanksgiving with family and friends. I roasted my turkey and made my stuffing in quite traditional ways, and friends provided a lovely assortment of sides (including the most sinful, creamy mashed sweet potatoes and beautiful, Indian-spiced roast parsnips). I pushed the boat out with my dessert this year though, and I don’t mind saying that I even impressed myself by making a pumpkin meringue pie. I have to make a confession now…I subscribe to Martha Stewart Living. I know, I know. I have a real love/hate relationship with the publication, because it does portray an aspirational lifestyle to the point of the ridiculous. As it arrives in my post box every month, I mock Martha for her ridiculous calendar entries (‘Confirm appointment with piano tuner’ ‘Vacuum wallpaper’) and then I drool over the crafting projects and recipes. There are always particularly creative ideas around the holidays, and I especially love the November and December issues. 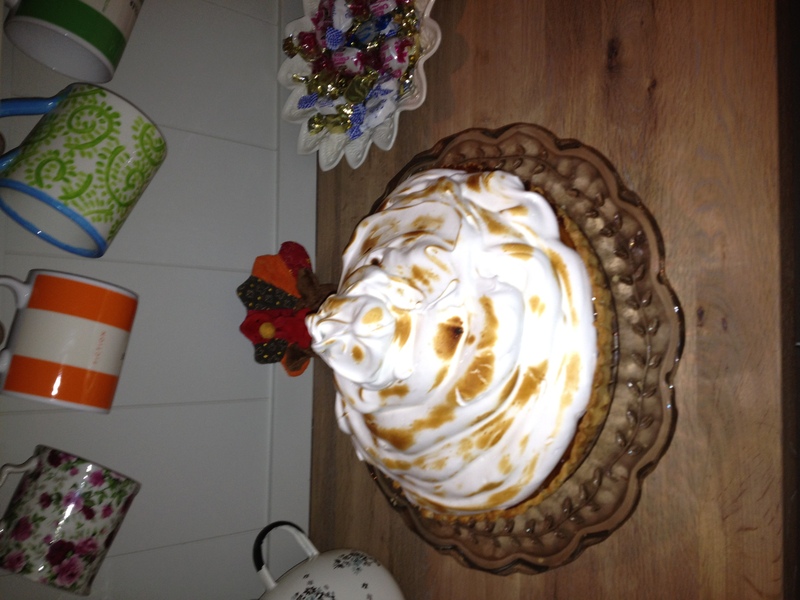 As soon as I saw the photo of this Pumpkin Meringue Pie I knew I had to try it, and as no one was likely to make it for me, I was going to have to bake it myself! I’m glad that I gave it a shot, but I don’t know if I’d do it again. The pros were: a visually stunning result, a change from the norm, an excuse to use my hand held blow torch, and of course, a tasty dessert. Cons included meringue panic (why did it take so long for the whites to stiffen?!?!?!? ), pastry panic (why is the pastry sticking to the tin?!?!?!?) and a lack of leftovers (The meringue melted overnight, making the last few slices very soggy and inedible). The last con is probably my most serious concern, as I LOVE Thanksgiving & Christmas leftovers. Waking up the morning after a big feast makes me giddy with excitement…despite the fact that hours earlier I was moaning that I’d never eat again, I skip down to the fridge to invent new things from the legs of turkey, piles of mash, bits of stuffing, and cold roast veg left in the fridge. Black Friday Breakfast is almost as good as Thanksgiving Dinner…I love making crispy potatoes cakes by chopping up the dregs of the fresh herbs and roast veg hanging around the fridge, mixing them into some leftover mashed potato, shaping them into cakes and coating them with seasoned flour. I fry them in butter for a few minutes on each side and top them with poached eggs. Then, of course, there’s soup made from Turkey Stock, turkey curry, turkey pot pie, and the old reliable turkey, stuffing, and cranberry sandwich. We should be finished our leftovers by the middle of this week…just in time to start thinking about Christmas dinner!